MEGAFLO CYLINDER INSTALLATION - Met Serve Ltd | Need an emergency plumber? MEGAFLO CYLINDER INSTALLATION - Met Serve Ltd | Need an emergency plumber? 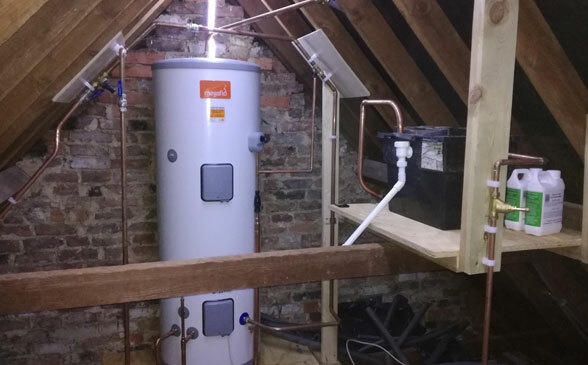 Our customer had an old Hot Water Cylinder (tightly situated in an airing cupboard) and old cold water tank (in the loft) that were feeding their property. We attended the property when investigating low pressure and an airlock. Due to the age of the units in question, and the fact that the customer was planning on having a new bathroom installed, we suggested that a new Unvented Cylinder be installed in place of the Hot Water Cylinder and Cold Water Tank. We removed the old Hot Water Cylinder and Cold Water Tank. Then installed the new 250l Indirect Unvented Heatrae Sadia Megaflo. In order to do this to regulations and installer guidance, we raised the height of the feed and expansion tank as necessary. Furthermore, we built a new (to water regulation) platform for the Cylinder to sit on and re-ran the discharge pipework so this was safe and fit for purpose. We connected and lagged all appropriate pipework and left the System operational. We’re very pleased with the work that Tom, Shaun and Paul did to install the Megaflow. It’s already made exactly the difference Tom has said it should do when he scoped the job. The install looks very tidy, and everything was cleared away thoroughly. I’d say they all went beyond the call of duty to continue with the work during that extremely hot weather - the delay was negligible and totally understandable. All three were good house guests over the 2-3 days, and were happy to explain the work when I went nosing around. Please pass on our thanks for a good job well done. I’d be happy to speak to anyone considering having similar work done.